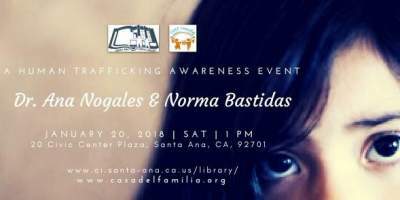 Santa Ana, CA – The Santa Ana Public Library, in collaboration with local nonprofit, Casa De La Familia, will host a Human Trafficking Awareness Event on Saturday, January 20, 2018 from 1:00 p.m. to 3:00 p.m. at the Santa Ana Public Library. Guest speakers include clinical psychologist, author, playwright and expert on human trafficking, Dr. Ana Nogales, and celebrated ultra-marathoner, survivor and international human trafficking activist, Norma Bastidas. With an estimated annual revenue of $150 billion and roughly 40.6 million enslaved individuals in 2016 – the majority of whom are women and children – modern day slavery is a lucrative industry and is closer to home than we think. It is for this reason we must take initiative to educate ourselves of this epidemic and the steps we can take to end it. El salón abre a las 12:30 p.m. El evento es gratis. El espacio es limitado, así que por favor llegue temprano. El programa se iniciará con el documental de Norma Bastidas, “Se Implacable” el cual se transmitirá simultáneamente en inglés y español. Después de la conferencia habrá oportunidad de conocer y saludar personalmente a la Dra. Nogales y Norma Bastida.